Open days are a great way to introduce your institution to prospective students. We can help with promotional merchandise ideas for your next open day with thousands of products that can be customised with your logo, name and message. Make an impression and leave your prospective enrolments with a lasting reminder. 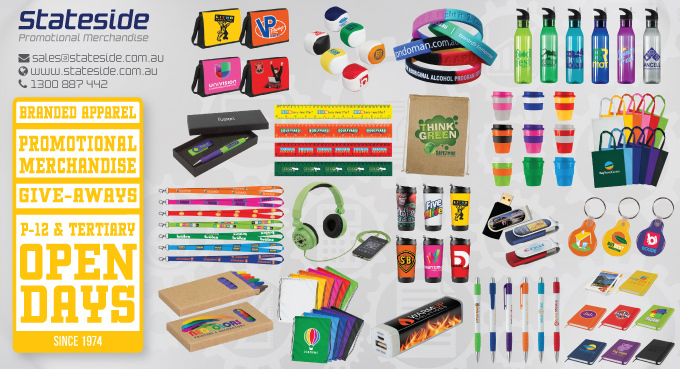 Browse our Open Day Merchandise Ideas: Lanyards, Badges, Non-Woven Totes, Coffee Cups, Pens, Notebooks, Wristbands, Eco-Friendly Products, Key Rings, Drink Bottles, Duffel Bags, Lip Balm, Stress Toys, Novelties, Tech Accessories, T-Shirts. Send us a Custom Merchandise Brief OR contact us for more information OR email us at sales@stateside.com.au. 320 gsm 65% cotton 35% polyester fleece stylish 2 x 2 thick strip rib for hem, cuff and collar hood with lining soft and comfortable perfect for leavers tops, clubs and street wear Click here for more Varsity Jacket and Hoodie options…..
© 2013 Stateside Distributors Pty Ltd. All Rights Reserved.